We give the entire SpeechWare TableMike series our "Best in Class" award. 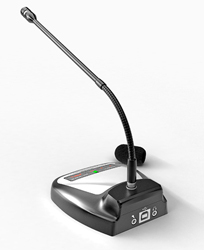 While there are important functionality differences between the 3 models, they all share characteristics that set them apart from all other table-mounted microphones on the market, including: 1) Auto-gain technology allowing automatic mic volume adjustments when changing distance from the mic, 2) outstanding digital signal processing to eliminate noise, 3) unique ability to use this microphone from distances between 10 and 20 inches and 4) a highly intuitive and functional "TableMike Configuration Application" which allows simple programming of accessory buttons. See the video below for a "hands on" comparison of the 3 models. Push Button Simplicity! All of our current generation SpeechWare TableMikes feature newly designed push-buttons which are large, visible and respond to a gentle push. In addition, the newly released "TableMike Configuration Utility" allows programming of the two volume buttons to affect up to six actions including initiating Dragon commands, Dragon Hotkeys, and emulation of computer key-strokes in all Windows applications, including versions of Dragon. This is the "third generation" TableMike from SpeechWare and the result of several years of the best Belgian engineering and input from a number experienced speech recognition users/resellers including Chuck Runquist, Larry Allen, Lunis Orcutt and Speech Recognition Solutions. Unique to this most recent build of the TableMike is larger, more easily pushed buttons which allow very simple use of the volume buttons with the TableMike Configuration Utility (available as free download). Compatible voice applications: Dragon NaturallySpeaking®, Microsoft Speech for Windows®, ViaVoice®, etc. An added bonus is that the Up/Down volume buttons can be reconfigured using the TableMike Configuration Utility to emulate up to six different keystrokes/hotkeys or Dragon commands. This product will also work well with a Mac computer. For a great review on use with a Mac see this review from MacWorld. In order to use a SpeechMike with a Mac you need to follow a few simple step detailed in our TableMike Mac Set-up Page. iPad & iPhone: No. Mobile devices do not provide enough power.MacWorld. Read our Mac set up instructions here. From Michael of Durham, North Carolina on 6/6/2016 . Eventually worked well. Had to do "check microphone" 5-6 times before it (or the softrware) settled on a volume range that produced good quality voice and good quality accuracy. Did all this in the near field mode (blue light) did not bother to train the farfield mode (green light). I think there was something to this effect in the instructions you provided. I'm pretty satisfied with the purchase. From Michael Gherrity of San Diego, California on 4/22/2016 . You must choose between several configurations for installation. So it is not as simple as plugging in a USB cable. However, the noise cancellation appears to work very well compared to my old microphone. From Marvin Szymkowicz of Bethesda, Maryland on 4/7/2016 . I am a long time Dragon user. I bought this to replace a USB headset mic. The headset gave accurate voice recognition, but the process of putting on and taking off the headset was a disincentive to using it. The tableMike is always ready to go. The TableMike is not quite as accurate as the headset, but it is an acceptable trade-off for the convenience. From Paul B of Sacramento, California on 8/9/2015 . Very easy to set up. I use it for Dragon and the quality and convenience are much better than the series of headsets that I previously used. Very satisfied. From Anonymous of oakland, Maine on 8/29/2014 . great microphone, actually recording this with it. Base is nice and heavy, feels sturdy. Connections seem solid. I have been a dragon user for over 10 years. I have been a medical transcription dragon user for at least 3 years. This particular microphone has a normal and VOIP range which works out great. I haven't played much around with the long-range. I'm usually at a computer between patient's inputting information. Nice on off feature on the unit allows you to maintain recording mode on the DragonBar, but mute locally. So far word recognition is pretty good. Seems comparable to any of the headsets I was using, and the great thing is I don't have that hanging around my neck anymore. I was only using the microphone component and didn't like the headset on my head anyway as I really don't need to hear anything. overall pleased, could've been a little less expensive though.